I am in a much better mood today, even though my image from yesterday still hasn't appeared. It's Friday and I am ready for the weekend. Lots of football and baseball, yea!!! Tonight I have a sentiment card to share. I just love this dp from Authentique Essentials. The image is from Paula Best and is stamped with Versacolor Pinecone. I used Spellbinders dies and DCWV cs. I sprinkled Swarovskis throughout the card. The sketch comes from Cardabilities #82. Thanks for stopping by. Not sure if you get me or Margaret tomorrow. One of us will be here!!! This is so striking and lovely. The colors are unusual and that's what I love about them...you never think to use yellow and it's such a happy color. The design paper is beautiful! What stinks about your image is that you can't blame anyone (I always blame the girls)...haha. Beautiful card!!!! Thanks for playing along with us at Cardabilities. I adore all the different pattern papers - they all go together so perfectly to create great interest. Thank you for sharing your art with us at Twist of Faith this week! 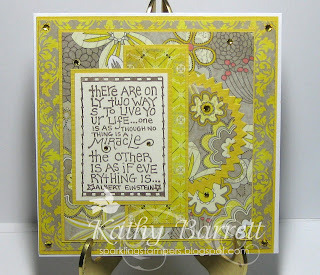 This card is a rhapsody in beauty, the yellows are so beautiful with the gray and pink. The sentiment is great, wish we saw more like it. We love to see your artwork; thank you for posting with us at Word Art Wednesday. Remember you can post up to FIVE projects this week. The various papers you have chosen for this creation are stunning! It's an elegant card, and I love the color scheme you chose to use. Thanks for sharing with us at Twist of Faith! Loving this yellow/gray color scheme. Thanks for sharing at Loves Rubberstamps. This is gorgeous, thank you for sharing with us at Crafty Sentiments...And good luck..
What a great sentiment and I love the fabulous dp colors and design. Thanks for playing with us over at Loves Rubberstamps!!! Thanks for joining us @ Loves Rubberstamps for the sentiment challenge!! I was instantly attracted to your papers and design, but when I read your sentiment, that's what really makes your card. Thanks for sharing your lovely art with us at Twist of Faith.